Our family at Bowers Harbor Vineyards invites you to explore the epic views of Lake Michigan and sample our award winning varietal wines. We are a boutique winery located in Northern Michigan on picturesque Old Mission Peninsula. Our cool-climate viticulture experience coupled with our hard work proves to produce superior quality Pinot Grigio, Chardonnay, Riesling, Pinot Noir, Cabernet Franc, and our signature meritage blend the 2896, Langley Vineyard. A visit to our quaint tasting room will afford you the opportunity to taste our sparkling wines, red wines, white wines, and view the quiet loveliness of Bowers Harbor. 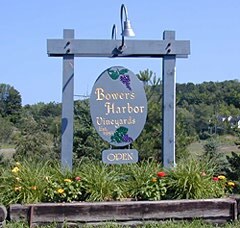 Wine tasting is comfortable and inviting at Bowers Harbor Vineyards; no need to be intimidated!